You can find all of this at just about any craft store. The first thing you want to do is find a suitable box. If you aren’t going to use one with a lid, I suggest you use a box that’s top and bottom are about the same size otherwise you’ll run into the same problem I did a few years ago. NOTE: A latch may be more efficient in case of accidental spills. Next, paint your box. I tried to work with as many items as I could that I already had on hand so I used a metallic, copper acrylic paint. I went ahead and painted over the hardware. I thought the gold clashed but I didn’t think it necessary to buy a latch to match (ha!). Don’t worry about painting the top because it’s going to be covered anyway. Now this part didn’t go as smoothly as I would have liked. I would suggest marking the proper sides with a marker so that your metal knick knacks attract instead of repel. Also glue as you go. A level 6 out of 10 magnet was used here, but you could use one that isn’t as strong. Don’t worry if it isn’t beautiful. It’s going to be covered. 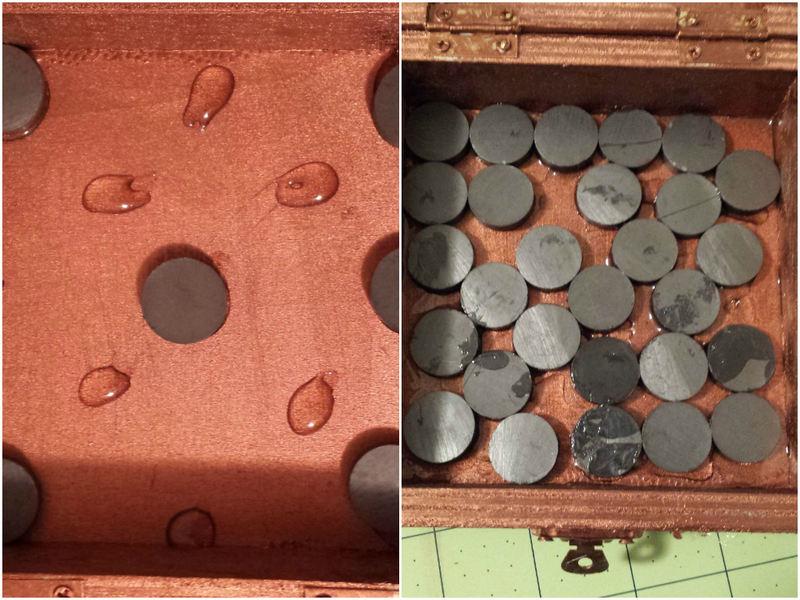 Once you let the magnets set for about 10 minutes, you can apply the sticky dots. You don’t have to use any glue on them, but sometimes they slip after a while so just to be safe add a little dab of glue. Let all of that set overnight. The box I bought came with a handy template. Don’t worry if yours doesn’t. Just trace the outline of where you want to place the paper. Start big and trim down if you have to. Once you have your pieces cut it’s time to bedazzle them. 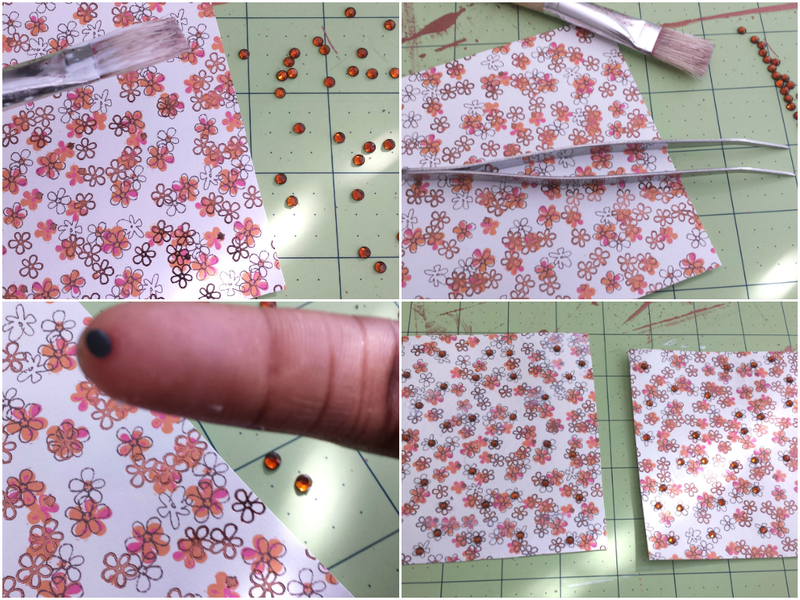 Apply your decoupage glue to a small area and place crystals. Depending on what you use you can either use a pair of tweezers or your finger to place the crystals. I found it easier to use my fingers. Just press down on the crystal and it’ll stick to your finger. 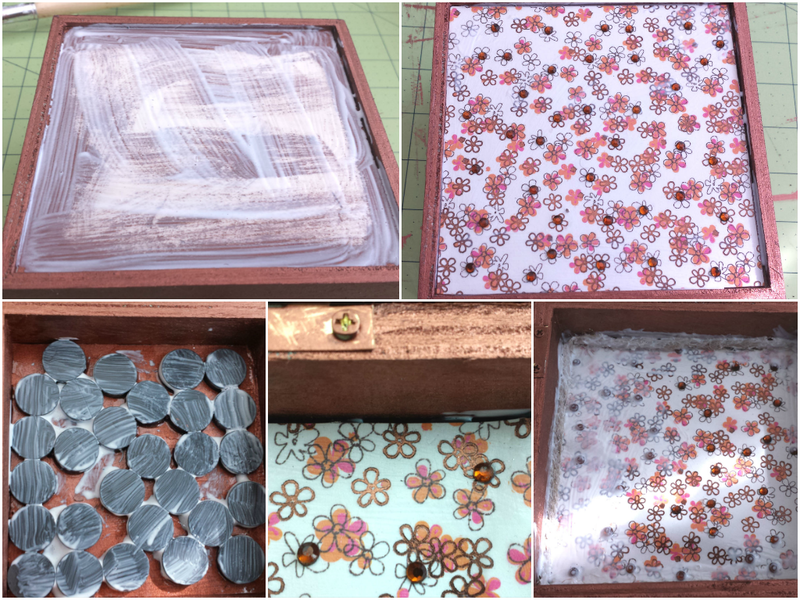 Simply press again with it on the area you want the crystal to go and so long as you have enough decoupage glue and it hasn’t dried any it will stick. Do this until you are happy with your design. Glue down your decorated paper to each side. The top was easy enough, but when I went to do the inside I ran into some trouble. I didn’t want the crack to show through so I used some jute cording I had lying around to embellish the edge then used the decoupage glue to seal any remaining openings. Get creative! Don’t scrap a project if you make a mistake. Turn it into something better! Once the glue dries it will be clear. TIP: Use the end of the paint bread to press in those corners for a clean, sharp corner. 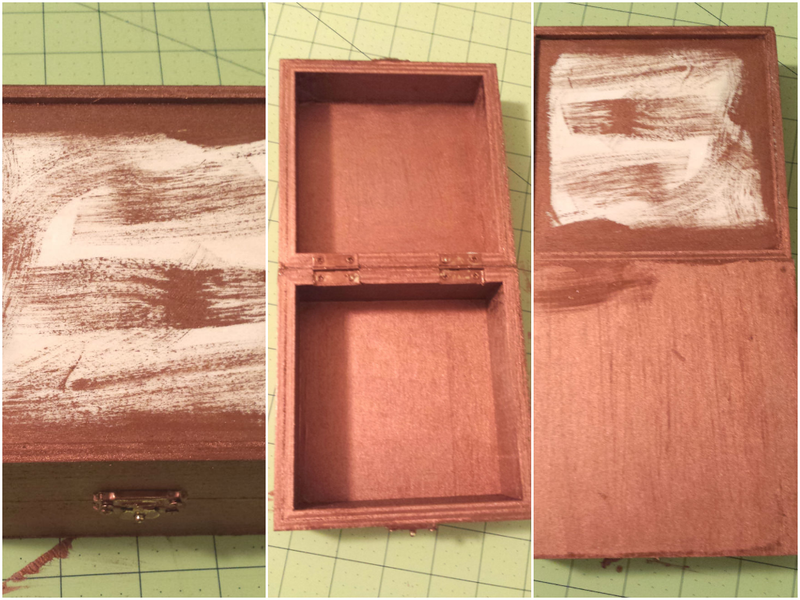 In order to match the inside I decided to embellish the outer top edges, too. 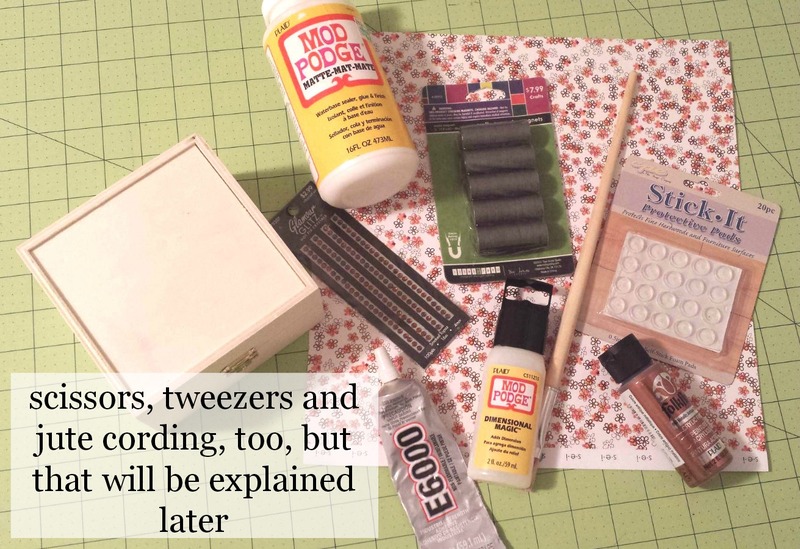 Use the jewelry resin to create the hard surface you want for your needles. You could also opt to mix a two-part acrylic for an even harder surface, but for such a small project this will be sufficient. Start around the edges first then work your way towards the middle. Be careful not to squirt to quickly or you’ll create bubbles that are ANNOYING to get rid of. lol Also, make sure you’re on a flat, even surface so everything spreads properly. Depending on how deep the surface is and how much you use you may need to let this set for anywhere from 3 hours to a couple of days. Better safe than sorry. Once your top dries you can go ahead and pour some resin underneath on the inside or you can leave it as is. And there you have it! A super cute way to store your pins and needles. Or you can skip the magnets and put other small items inside. HINT: This makes a really cute gift. 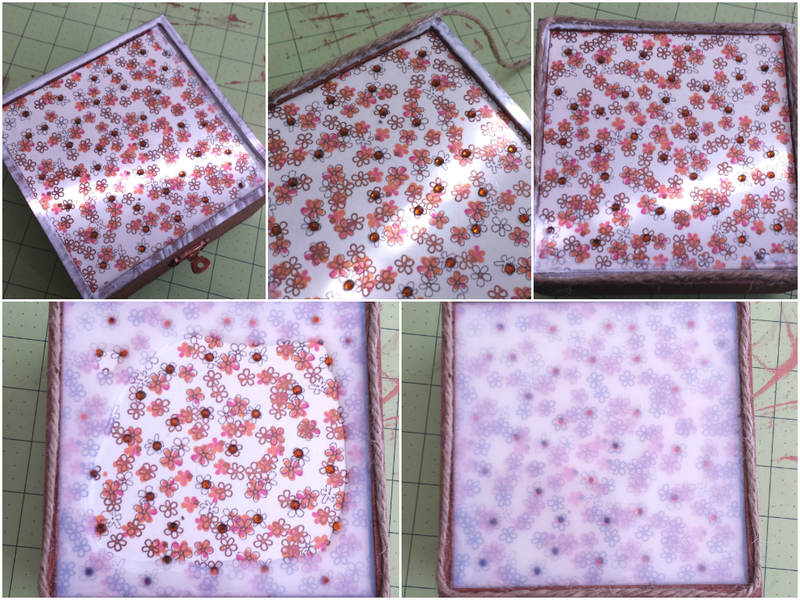 Use felt to line under the lid and/or the bottom of the inside of the box. Use sandpaper to distress the paint. Paint multiple layers using different colors and distress in between layers for a whole new look! Depending on the size of your box you could add hooks on which to hang things from. Don’t be afraid to switch out the hardware if you don’t like it or to add to it if there’s none there. Who doesn’t like a bow? Or a flower? 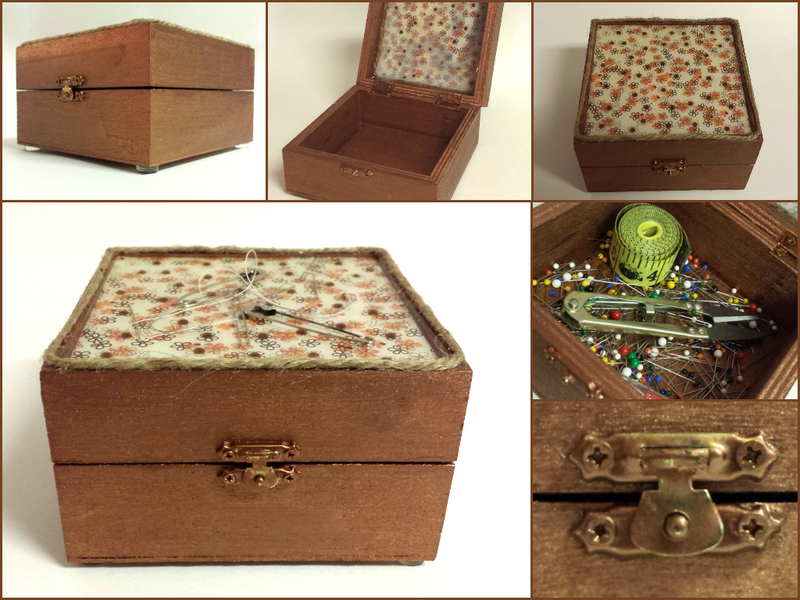 This entry was posted in Crafts and tagged bedazzle, decorative box, jewelry, jewelry box, knick knacks, needle holder, sewing, treasure, trinket, trinket box. Bookmark the permalink.